Butterfinger's newest addition infused with caffeine. This past week an unexpected package was rushed to my door via overnight shipping. Anxious to find out what was so urgent, I ripped open the package to find two brand new Butterfinger Buzz candy bars. I’m telling you, this left me speechless (minus the uncontrollable “YES!” that escaped me, that is). 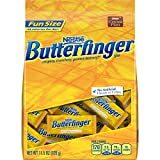 Butterfinger has always been my go-to candy bar love affair and with this, I quickly realized what was really in the package: destiny. I knew what to pay attention for before even taking a bite, thanks to Snickers Charged. Snickers Charged to me is not a candy bar improved by the addition of caffeine, but rather plagued by it. Snickers Charged failed to cover up the bitter taste of caffeine and as a result I’ve been seeing less and less of this bar in stores. 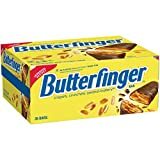 My heart sank and tears began to form as the possibility of a bitter Butterfinger experience crossed my mind. What if the taste sickens me and conditions me to hate Butterfinger for the rest of my life? I had some thinking to do so I opened up a wrapper, sat back, and munched down a bar to help me think. I finally decided it would be worth it to take a risk and try the bar and then realized I already had. As I considered the possibility of getting psychiatric help for my subconscious sugar addition, my taste buds sent confusing messages. Butterfinger Buzz tastes like Butterfinger up until you’re ready to swallow, where inevitably there is a dreaded bitter caffeine aftertaste. Thankfully though, this aftertaste is fairly short-lived, especially in comparison to Snickers Charged. Nestle, you’re so close! As far as I can tell, this is just a King-Size Butterfinger bar with the addition of 80mg of caffeine. Unless a can of Red Bull dependably gets you wired (which it shouldn’t), you’re not going to get much of a Buzz from this candy bar. An energy drink junkie, I got absolutely no energy kick from this bar. Alternatively, I predicted a slow and steady energy delivery since half of the bar stays stuck in your teeth, but this didn’t happen either (joke). Rather, I ate the second bar later on with a Rip-It Power. These are two of my favorite tasting things in life, both of which sadly lack a formidable energy boost. Together though, HARMONY! What I’m trying to say is that Butterfinger Buzz will turn your favorite tasting low-caffeine drink into a high-powered can of wake-up juice. For example, if you’re tired of the standard energy drink taste, grab a Mountain Dew (or your favorite soda) and a Butterfinger Buzz. Mountain Dew will help cover up the caffeine aftertaste, and together they will deliver an energy fix! If you just want a Butterfinger for the taste, then go with a standard Butterfinger.